Sala Wong is a New Media artist. 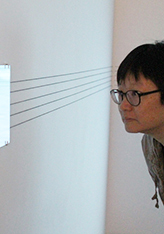 Her work manifests in digital media, installation, sculpture, wearable art, computer-controlled environments, and locative media. Her large-scale multimedia installations explore real and virtual spaces through augmentation. Most recently, her work investigates issues of diversity by means of documentation and intervention in public urban spaces. Her research concerns the interaction of spaces and everyday life. She produces conceptually oriented art works that evaluate social, political and cultural issues by distilling the complexity of contemporary life into concise yet open-ended aesthetic experiences. Indeterminacy, site-specificity, interaction, process, participation and experience all play a part in her artistic practice. Wong's work has been funded by competitive grants, and she has been invited to produce art and present workshops at prestigious residencies, museums and cultural centers. In the recent past, her work has been shown in Russia, Thailand, Japan, USA, Canada, Finland, Estonia, Czech Republic, Singapore, Taiwan and Hong Kong. Wong has won numerous awards and grants from arts organizations in Canada and USA.